When it starts to get cold (and snowy) out, nothing is more hearty and comforting than a piping hot bowl of soup. On Friday we purchased some pumpkins for carving but only ended up using one, so I decided to see what I could do with the other one. I started off by roasting it, because I figured it would be easier to work with that way. 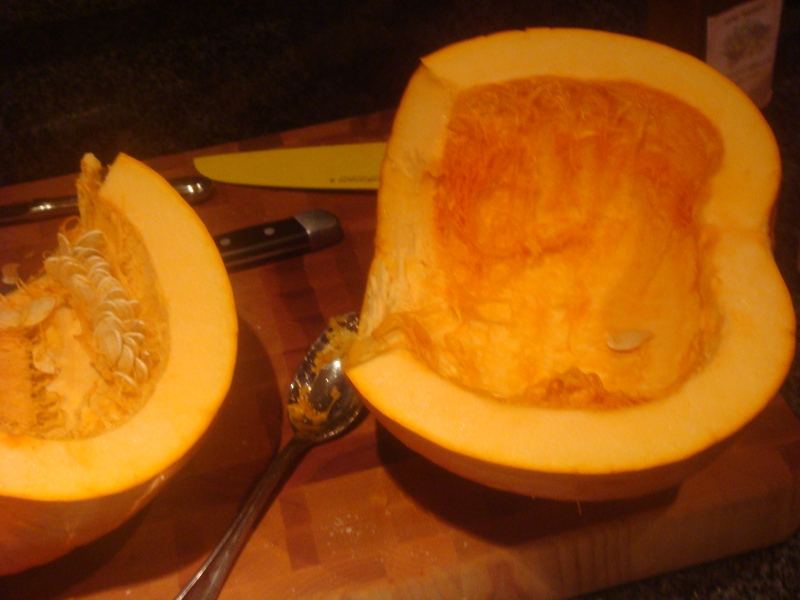 To roast the pumpkin you first need to cut it in half and remove the seeds and stringy innards. The easiest way to do this, I’ve found, is to start as if you’re carving a pumpkin, by cutting around the stem and removing it. Without the stem all you need is a heavy duty knife and with a little muscle you can halve it easily. Scoop out the seeds and set aside in case you want to roast them later. The pumpkin I had was a medium sized one, so I cut it into quarters, sprayed it with some Pam, and put it in the oven in a cake pan filled with 2 cups of water. I roasted it at 450 degrees for 40 minutes. I had found a recipe from the NYTimes for a carrot and tahini soup that seemed intriguing especially since I had a LOT of tahini still in my fridge from last month’s baba ghanoush (there’s no way to buy tahini in small quantities.) 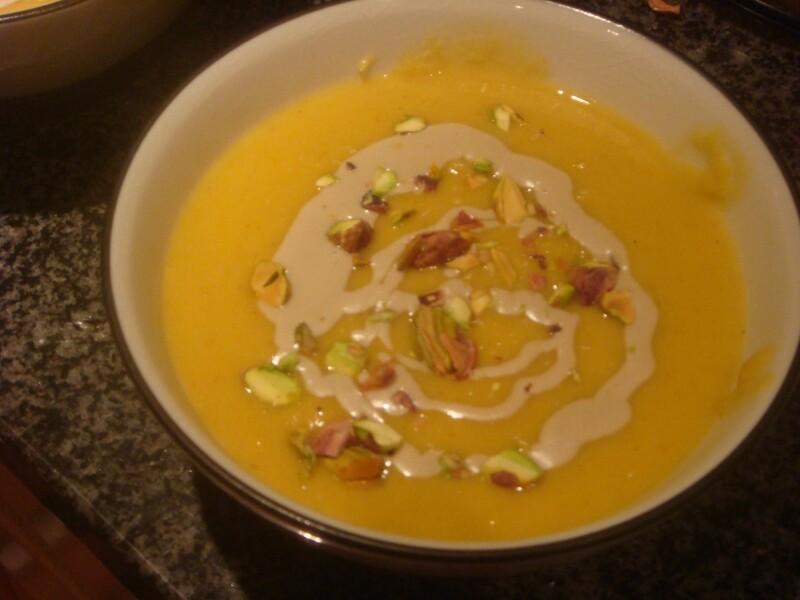 So I decided to create a spiced pumpkin and tahini soup, which I’ll be sharing with you now. If you have a dutch oven that sits in your kitchen taking up a lot of space and being really heavy, this is the time to use it! As you know, I never measure my spices, but I was most generous with the curry powder, I probably used 1 teaspoon of that and 1/2 teaspoon of the cumin, garlic salt, and chili powder. I went easier on the cayenne and crushed red pepper flakes because I have a tendency to add way too much heat to dishes. You can always add more spice later, but it’s really hard to take it away. 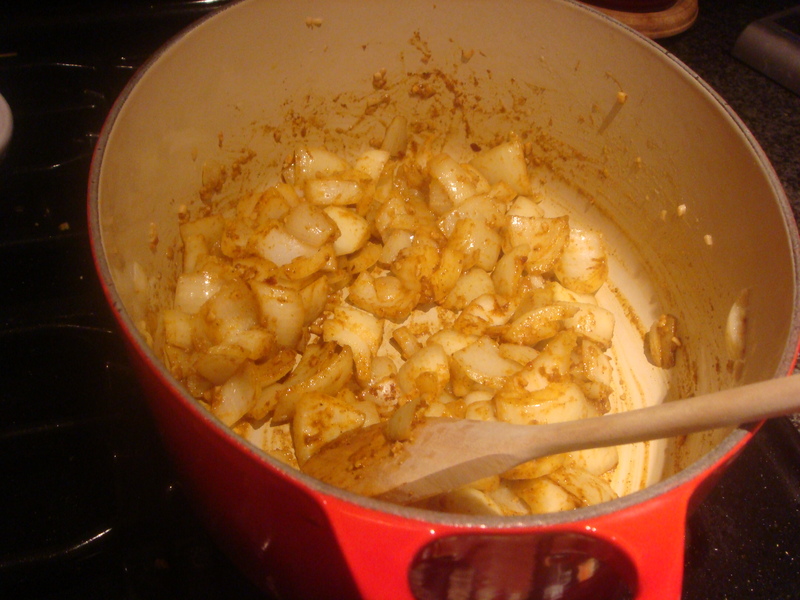 Stir spice blend together with onions and garlic over medium heat until onions get very soft and spices are well toasted, about 5-7 minutes. In the mean time, your pumpkin should be ready to come out of the oven. This medium sized pumpkin had a lot of flesh so I used half for the soup and reserved the other half for some ginger pumpkin muffins I’ll be making this week (I diced and pureed the pumpkin using an immersion blender and put it in a Tupperware in the fridge). 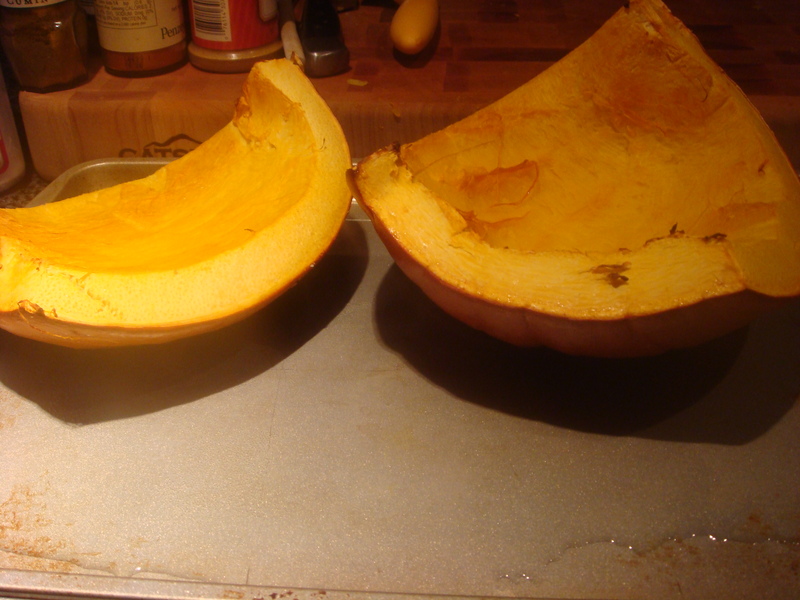 To prepare the pumpkin for the soup, scrape the skin off the pumpkin and cut flesh into cubes. Don’t worry about the size of the cubes, you’re going to puree everything together at the end anyway. My half pumpkin yielded about 4 cups diced flesh. If you don’t have pumpkins laying around your house, you don’t need to go out and buy any (unless you really want to). 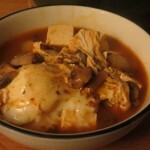 You can easily substitute canned pumpkin puree which can be found in the baking aisle of any supermarket. Add pumpkin to pot and stir to coat with spices. Add 4 cups canned chicken broth (or vegetable broth if you want to make this dish vegan). 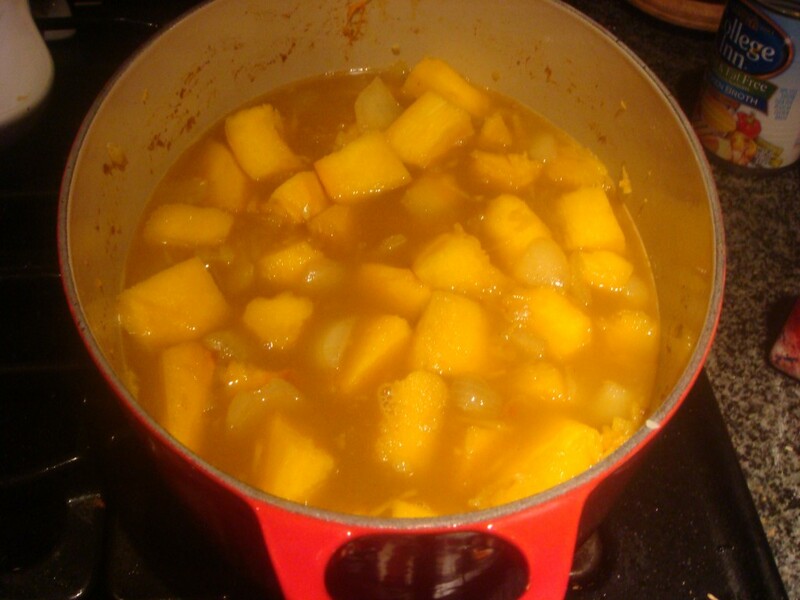 Cover and bring to a boil, then reduce heat and simmer, covered, for 10 minutes or until pumpkin is completely cooked. 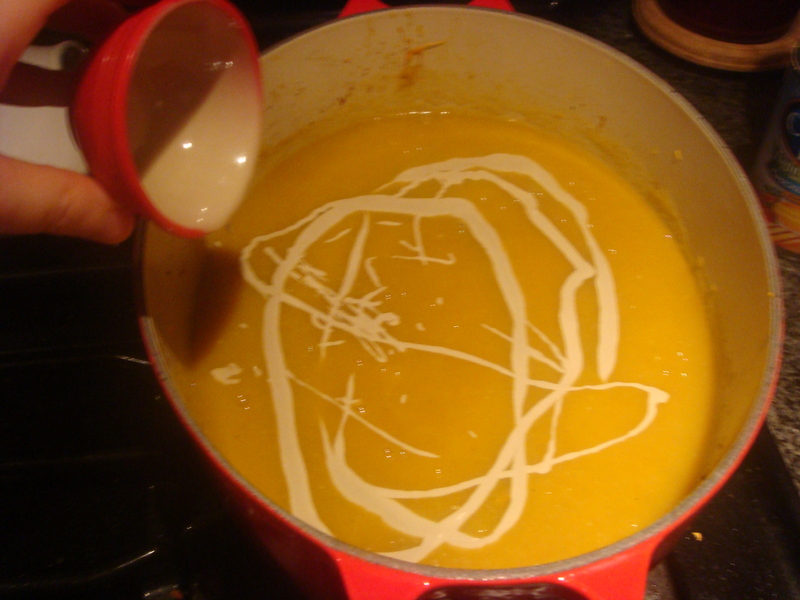 Turn off heat and use an immersion blender to puree the soup until smooth. Also, if you don’t have an immersion blender you can puree the soup in a normal blender or food processor. But, really, if you don’t have an immersion blender by now, please go buy one! They’re like $30 and are such a great kitchen gadget — so much easier to clean and handle than either of the alternatives. At this point you’ll want to taste your soup for spice level. It should be a little spicier than you want it to end up because you’re about to mellow out the flavor. Add 1/3 cup tahini and puree until incorporated (your soup will become lighter at this point, and you’ll be able to tell when all the tahini is evenly mixed in). And that’s really it. What you end up with is a really hearty, but healthy soup with a complex flavor profile and a nice lingering heat on the back of your tongue. I served the soup with a drizzle of tahini and some chopped pistachios which added a nice salty crunch. You can add toasted pumpkin seeds for the same effect. I hope you enjoy the soup as much as I do. It’s really filling and would be great with some crusty bread. This recipe makes a lot of soup, so you’ll definitely have leftovers. I’d say it could feed 4 or 5 as a main course, or more as an appetizer.